One of the most popular choices in the Peerless’ line of faucets, the P299578LF-SS is feature-rich and beautiful. While it doesn’t have the whistles and bells of high models, it makes a brilliant pick if you’re in for an easy-to-operate faucet while adding a touch of excellence into your cooking place. Anybody in your household can use the P299578LF-SS. Its arc can rotate at 360 degrees, enabling the user to activate the water flow with little effort. In fact, you can turn it on using less than five pounds of force without straining or twisting your wrist. Besides, this faucet is only 12 inches high so reaching it shouldn’t be much of a problem as long as your countertop isn’t 48 inches from the ground. With such functionality, the Peerless is an excellent model to purchase if you have teens that may need to use a faucet in your house. Sure, this faucet may be all about ease of use, but that doesn’t mean it falls short when it comes to spewing out water. With a generous water flow of 1.8 gallons per minute, it will fill your pots quickly. Plus, you don’t have to spend a lot of time to wash or rinse your dishes. In short, the P299578LF-SS’s output is enough to handle day to day needs of any kitchen. Make no mistake about it – despite its water flow, this faucet will not put your water to waste. It meets the CALGreen standards to allow you to conserve water and by extension save you money. Other than that, it complies with the California and Vermont low lead legislation. Put differently; it contains less than 0.25% of lead to ensure that the water in your kitchen is safe to drink. Now, that’s a faucet you’d like to own, right? One of the most important considerations to make when purchasing a kitchen faucet is the ease of use. Indeed, you want one that doesn’t take a lot of effort to operate. The Peerless P299578LF-SS touts cleverly located handles so you can control its water flow in a cinch. Other than that, the strategic positioning of the levers enables you to dial in pressure and temperature settings accurately. Think of it as a function to ensure that you capitalize on what this faucet can do without having to do a lot of work. We must add that the positioning of the handles allows flexibility of installation. What we imply is that you can install the faucet in reverse and push the handles away from you or the other way round. Yes. The Peerless is high enough so you can wash your tall and larger appliances conveniently. It will give you unobstructed access to your sink so for a better dishwashing experience. Those who’ve used this faucet say the water flow stop right when you switch it off, further reducing water spots on your countertop. We bet you’ll love the red and blue color indicators on the handles to help you denote which handle is cold or hot. We couldn’t help but notice the super-thoughtful sprayer on the side. Just as the name suggests, the sprayer fits nicely on the side of your sink, allowing you to fill your pot quickly. It also makes cleaning the area around your sink a lot easier. And oh, you this faucet is compatible with an 8-5/8″ deck to aerator for a non-splashing stream. And for those who may want to know, this is a four-hole faucet. 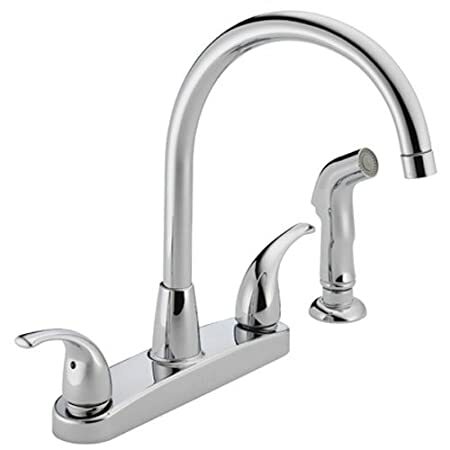 The Peerless P299578LF-SS Choice is good faucet if you’re scouting for something affordable and visually appealing. And, thanks to the five-star performance, it deserves mention among top kitchen faucets you can get on the market at the moment. Reviewers say it is a reliable model that will stand the test of time, irrespective of how busy your kitchen is. To wrap it up, this faucet is available in chrome and stainless steel finishes giving you a little bit more choices.